I don’t post on Tuesdays. Well, I did, on January 2nd, because that was the day Linda G. Hill used my contribution to her super fun Just Jot January prompt series. 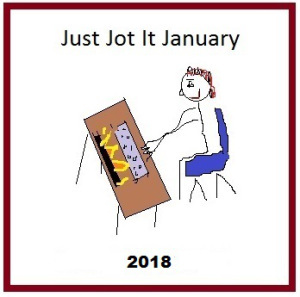 So, I thought I’d play one more time, as we are rapidly running out of January, and Linda has done a fantastic job of motivating lots of wonderful bloggers. But, in deference to my equally wonderful readers, I offer very few words, as the prompt and a single photo from breakfast last Friday with my best friend are all I need. Oh, one more thing, give nod to Judy Martin, the contributor of today’s prompt. As Linda is so fond of saying, Enjoy! Trust me, this was scrumptious. I trust you Dan. Steak, potatoes and eggs. What wouldn’t be scrumptious?! Time spent with your best friend! Priceless. Now, my idea of an equally scrumptious breakfast is chocolate cream pie, or leftover pizza, or baked ziti or lasagna…..cold! Lol. Those are all good breakfast ideas. Special-K might be healthier but nobody ever confused it with something scrumptious. I tend to stick to M-W-Th-Sat schedule, but I make exceptions for worthy causes. I don’t want to wear out my welcome in anyone’s inbox. And, some days just don’t work for me. And, I ate a small bowl of cheerios this morning? Looks delish. Good for you, Judy. Heart healthy…right? I meet my friend after I get my hair cut, but he isn’t always available. So, I have that breakfast, maybe 8 times a year. You can keep the meat and I’ll take the rest of it. Scrumptious for the masses. It was very good. We split the potatoes, so, you know, healthy. No (but that’s a good idea) it’s a slice of ham. Thanks. Sorry if I made you hungry. Golly! I was trying to get you to at least smile. Now I feel bad that I didn’t make you smile. Thanks Judy. And thanks for the prompt. Still want to come back in the next life as you. Just for the eats mind you. Ha ha. I almost added a disclaimer for you, John. 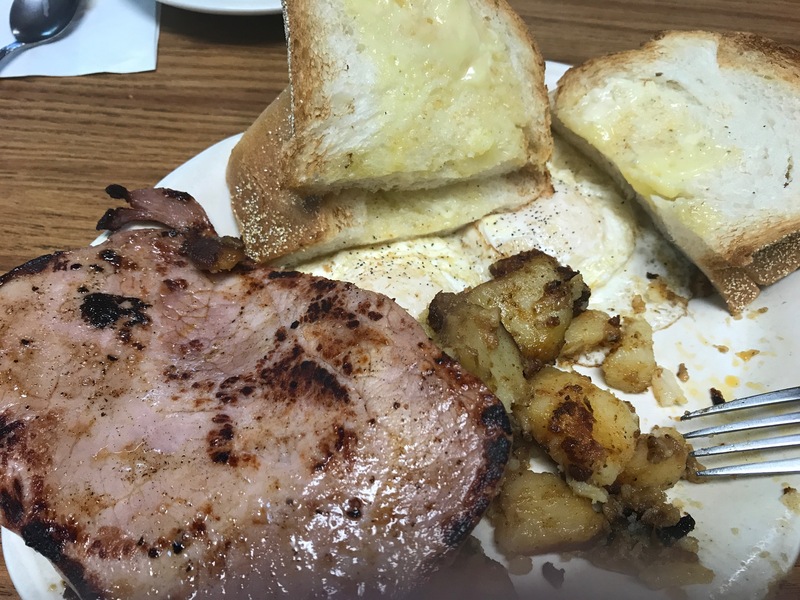 Breakfast is one of my favorite meals…as I head into the dinner hour reading this post and looking at that breakfast….I’m thinking we need to re-evaluate our evening meal…. Yum! What a way to start the day, Dan. Thanks Audrey. I wish I was starting this one the same way. Ham, 2 over easy, sour dough with butter, and potatoes-home friend…with a pot of black tea with my BFF, Tabasco, and ketchup…scrumptious and sublime! You nailed my friend! Thanks Deborah. The hard part was remembering to take the photo before digging in. Thank you for all the work you do with these prompts, Linda. I really enjoy reading the entries throughout the week, and throughout January! I love fried bologna – we had that s lot when I was growing up.